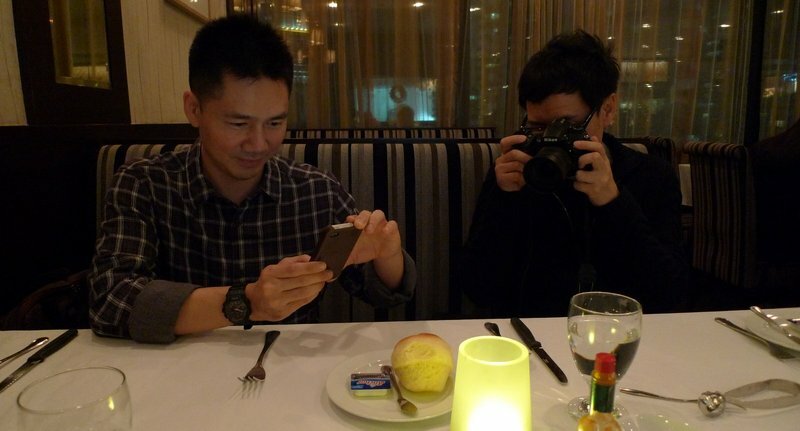 This entry was posted in Uncategorized and tagged hong kong, Meetup, xanga by christao408. Bookmark the permalink. Ah the tea! 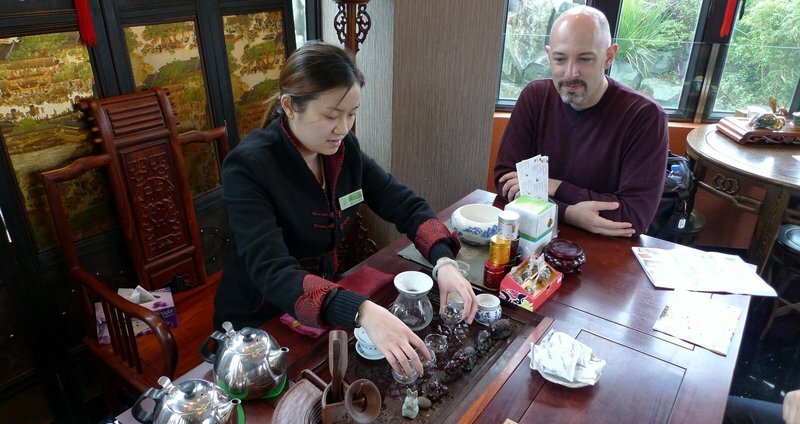 Do you also witness the tea ceremony – it is beautiful! I can’t wait to see the rest of the pics. The gondola ride looks interesting but I’ve always had this thing about heights. I suppose the mini xanga get together will be more featured than the vegetarian lunch? I suppose Phoenix palms is another code word for chicken feet? I didn’t know what trotters were until someone said what they are. Phoenix palms! Awesome! They look like they’re made my favorite way, too. @PPhilip – The vegetarian lunch was decidedly uninspiring, so I will probably not bother sharing it. @n_e_i_l – Hadn’t heard that name, but certainly better than “chicken feet”. @CurryPuffy – There were limits to which Xangans could be shown in a picture and this one seemed safe enough. @ElusiveWords – One of our group was not too thrilled about the gondola ride, either. The view of HKG airport was amazing, though! @Fatcat723 – Yes, the lady performed the whole ritual for us. Very good way to kill an hour as the rain fell. It was a great meet up with you all …..Happy New Year 2013!! I never get bored of Hong Kong. I am going to Japan. @n_e_i_l – @christao408 – @PPhilip – That’s what it’s called in Chinese… but I think it would be more accurately translated as ‘phoenix claws’. I’d love to see the monastery up close one day. And that dinner roll ~ looks much better than the phoenix palms. You always have the best adventures! I was very amused at the dinner roll photo shoot! hehe! I’m only guessing (and hoping) you go into some detail – especially concerning the “phoenix claw” as I’m a curious creature and I’d like to know more! It seems we’re continually swapping cities!! Seeing that skyline makes me miss it all so much. Hope you had an amazing time, and can’t wait to hear all about your trip! 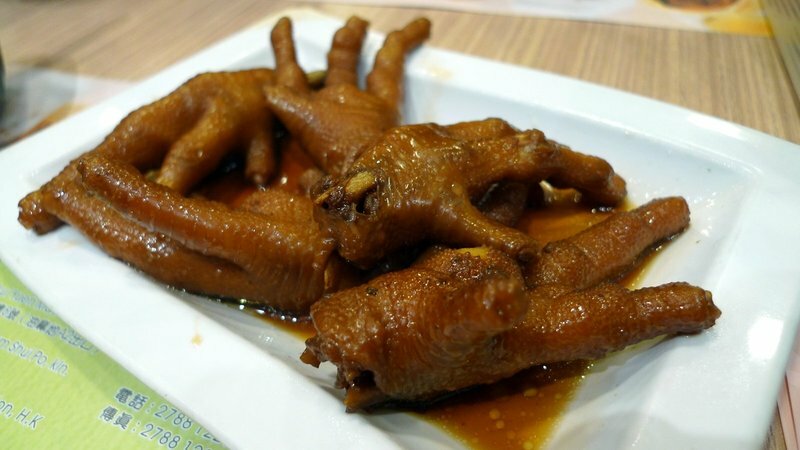 Chicken feet are still intriguing to you? It makes me wanting to visit Hong Kong so bad!! Thanks for sharing and Happy New 2013 to you and Tawn! @stepaside_loser – Yeah, that’s a funny one, isn’t it? @rudyhou – Yes we did… had I known we were going to eat at the other branch a few days later, I would have said “no way”. @Wangium – Well, not intriguing to me, but intriguing to at least some of the people who read my blog. @gasdoc73 – Thanks – HNY to you, too! @oxyGENE_08 – Indeed. I recall that you were possibly going to join us. Maybe next time? @mizz_chan – Yes, you and I really are city swapping! @murisopsis – I edit out the mundane and hype the rest, thus making it appear like I’m having the best adventures! =)@chronic_masticator – Sadly, I didn’t take many pictures of the monastery itself. On the one hand, it wasn’t that special. On the other hand, it was drizzling and I didn’t want to get wet. @amygwen – Love Japan – please enjoy for me. @Xx_DeUce_xX – Thanks for clarifying the translation for us. Sure sells better than “chicken feet,” huh?